Sunnyvale, California, 20th November – Powerful, fast and as graceful as a big cat on the hunt: with the Mercedes-Benz AMG Vision Gran Turismo, the Stuttgart-based premium brand today presented its visionary concept for a super sports car. Mercedes-Benz designers developed it specifically for the new PlayStation®3 driving simulator, Gran Turismo®6 (GT6 ™). Extreme proportions, sensual contours and precise graphics blend to form a body that visually confirms the breathtaking performance of 430 kW (585 hp) and 800 Nm of torque. As a 1:1-scale model, the Mercedes-Benz AMG Vision Gran Turismo is celebrating its world premiere at the opening of the new Mercedes-Benz Research & Development Center in Sunnyvale, California. Before the end of the year, this super sports car with hallmark Mercedes gullwing doors will take to the virtual racetrack. As the first “Vision Gran Turismo” model, it will be available for download when Gran Turismo 6 goes on sale in December 2013. To mark the 15th anniversary of the best-selling Gran Turismo® series, Kazunori Yamauchi, creator of Gran Turismo and President of Polyphony Digital Inc., called upon the world’s leading automotive manufacturers and design studios to look forward into the future. “Vision Gran Turismo” inspires leading design studios to give car enthusiasts a glimpse into the future of automotive design and technology with innovative concepts that will be brought to life as playable vehicles in Gran Turismo 6 (GT6™). The visionary concepts will be gradually unveiled in GT6 through online updates. The designers at the Mercedes-Benz Advanced Design Studios in Sindelfingen and Carlsbad (exterior design) and also in Como, Italy (interior design) succeeded in developing the Mercedes-Benz AMG Vision Gran Turismo in a relatively short space of time. As part of this they worked precisely in accordance with the regular design process for new series production vehicles and show cars. It is almost impossible to develop a vehicle in such a short time – but the hearts of the Mercedes-Benz designers beat with a passion for super sports cars. The modern design language combines classic design elements from motor racing history, a fact which helped to accelerate the creative process enormously. Gran Turismo 6 players will soon be able to choose an alternative version of the virtual Mercedes-Benz super sports car. The “Mercedes-Benz AMG Vision Gran Turismo Racing Series” offers further enhancements over the regular show car which was presented as physical 1:1 model in California. To ensure perfect downforce and therefore great handling stability in tough racetrack conditions on PlayStation 3, the Racing Series has a fixed rear spoiler while the show car version has an extending variant of this integrated into the boot lid. In addition, the third brake light in the middle of the rear end lights up in red as the Gran Turismo logo, unmistakably confirming the identity of the high-performance gullwing racer. Visitors of the LA Autoshow were the first to drive this car virtually in Gran Turismo 6 next to the 1:1 show car at the Mercedes-Benz booth. “By virtue of its proportions and expressive appearance, the Mercedes-Benz AMG Vision Gran Turismo embodies the brand’s defining design philosophy of sensual purity in a unique way. The design of this concept car as part of the Vision Gran Turismo project reflects to extreme effect the perfect symbiosis between emotional, sensuous contours and intelligently presented high tech,” says Gorden Wagener, Vice President Design Daimler AG. The sports car proportions that are a typical Mercedes feature have been reinterpreted: the long bonnet has a flowing transition into a compact greenhouse offset to the rear, which takes the form of an aerodynamically efficient water drop to descend slightly at the rear, where it rests on the powerful, stylish rear end with broad shoulder contours. The dynamic aura is accentuated by an extended, dramatic side contour and a pronounced bulge to the wheel arches, which blend into the low-slung, muscular bodyshell. The long wheelbase, small front overhang and slightly longer rear overhang likewise give visual confirmation of acceleration power. An elegant contrast with the flowing, sensual contours is created by the clear geometric graphical elements that highlight technical features such as the headlamps, radiator grille and tail lights. The angled headlamps, with their colour scheme and determined look, convey a sense of sportiness and readiness to leap forward. This impression is reinforced by the bonnet with its expressive forms and motorsport details, such as the release catches on the bonnet and the fuel cap, for example. The red-glowing contour lines on the lower part of the vehicle create an effect similar to that of exterior ambient lighting and stand out from the silver-painted bodywork. This makes the Mercedes-Benz AMG Vision Gran Turismo look even more aggressive. Another eye-catching feature is the radiator grille – a reinterpretation of the wide Mercedes-Benz sports car grille with central star. Its shape is reminiscent of the legendary 300 SL racing car that won a glorious victory in the 3rd Carrera Panamericana in Mexico in 1952 – one of the world’s toughest long-distance races – despite the famous accident with a vulture. However, the radiator grille of the Mercedes-Benz AMG Vision Gran Turismo does not feature classic louvres but rather exclusively LEDs. The variable LED grille with different light patterns is a further development of the diamond grille introduced with the new A-Class. The majority of the LEDs are arranged to represent five horizontal louvres. When the daytime running lamps are switched on, the centre “louvre” lights up to show the front aspect that is typical of Mercedes sports cars. When the racing lights are switched on, numerous LEDs light up in green in the background, like round fog lamps. 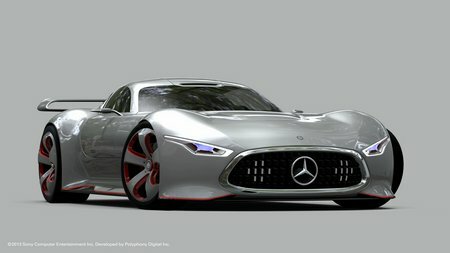 The virtual Mercedes-Benz AMG Vision Gran Turismo was created from the physical 1:1 model – with two small differences. To ensure perfect downforce and therefore great handling stability in tough racetrack conditions on the PlayStation 3 system, the virtual super sports car has a fixed rear spoiler while the show car has an extending variant of this integrated into the boot lid. In addition, the third brake light in the middle of the rear end lights up in red as the Gran Turismo logo, unmistakably confirming the identity of the high-performance gullwing racer. The exterior design, which is systematically geared to motor racing and therefore reduced to the bare essentials, is congenially mirrored in the interior of the two-seater. The functional yet elegant interior design exudes powerful, passionate sportiness. Inspired by a Formula 1 cockpit, the red integral sports seats provide perfect lateral support and blend into the black flooring of the footwell to form a protective shell. The form of this flowing, sculptured shell is clearly dedicated to function, ergonomics and safety – and suggests enormous forward thrust. A truly eye-catching feature is the dashboard, which takes the form of two gullwing doors which are positioned on each side of the steering column. As a result the actual doors themselves appear to be an extension of the dashboard. The dashboard therefore has a particularly dynamic and sensuous appearance. The central display is optimally positioned in the driver’s field of vision: it takes the form of a glass surface floating directly above the racing steering wheel with its shift paddles, and shows all the relevant information such as road speed, engine speed and operating temperature as required. Operation is by rocker switches in the centre of the dashboard and in an overhead console, like in a jet. The steering column visibly penetrates the firewall to the engine compartment, creating a visual connection between the driver and the heart of this super sports car, the AMG V8 front-mid engine. The AMG V8 biturbo engine delivers an exceptionally agile response to even the smallest movements of the accelerator. It develops 430 kW (585 hp) and a maximum torque of 800 Nm. With an aluminium spaceframe body and components in carbon fibre, the material of choice in motor racing, the Mercedes-Benz AMG Vision Gran Turismo tips the scales at only 1385 kilograms. That amounts to around 2.4 kilograms per hp – an unrivalled figure in the super sports car segment, and one that guarantees exceptionally dynamic performance. The weight distribution of 46 percent at the front and 54 percent at the rear likewise promises plenty of driving pleasure. The engine is combined with the AMG SPEEDSHIFT DCT 7-speed sports transmission, which is systematically configured for outstandingly dynamic performance. Excellent deceleration values and fade resistance at the highest level are ensured by the AMG ceramic high-performance composite braking system. The AMG sports exhaust system with eight tailpipes integrated into the rear end provides a powerful accompaniment whenever the car accelerates, and ensures an unrivalled motorsports sound experience. For fans of Gran Turismo 6, the Mercedes-Benz AMG sound specialists have created a powerful, sonorous exhaust note that authentically celebrates the V8’s love of high engine speeds. The high-frequency sound signature when accelerating under full load is particularly reminiscent of the racetrack.